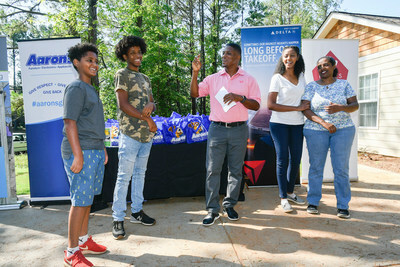 ATLANTA, July 2, 2018 /PRNewswire/ -- Aaron's, Inc. (NYSE: AAN), a leading omnichannel provider of lease-purchase solutions, and its divisions Aaron's and Progressive Leasing, surprised two single-parent families with fully furnished new homes last Wednesday in Atlanta. 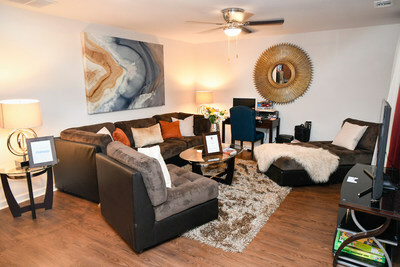 Mothers, Hasna Hussien and Zulfa Jobir, and their children received homes full of new furniture as part of the Homes for the Holidays (HFTH) program sponsored by former NFL star Warrick Dunn. 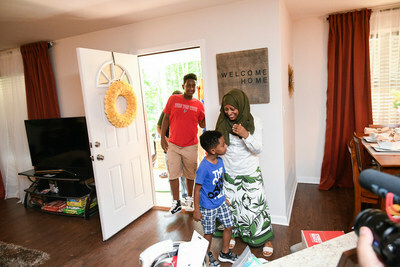 Hussien’s home was the 160th home presentation by Warrick Dunn Charities' (WDC) Homes for the Holidays program, which assists single parents in becoming first-time homeowners. In partnership with Aaron's and Habitat for Humanity affiliates, WDC provides the materials necessary for long-term stability and the provisions required to make a meaningful impact on the parents and their families. Jobir’s home was the 161st home presentation by Warrick Dunn Charities' (WDC) Homes for the Holidays program, which assists single parents in becoming first-time homeowners. In partnership with Aaron's and Habitat for Humanity affiliates, WDC provides the materials necessary for long-term stability and the provisions required to make a meaningful impact on the parents and their families.